The FeelGood Foundation will be hosting a Zadroga Act seminar in Springfield Virginia March 31st and Philadelphia April 1st. The purpose of these seminars is to educate area 9/11 Responders on the benefits they are entitled to under the act. 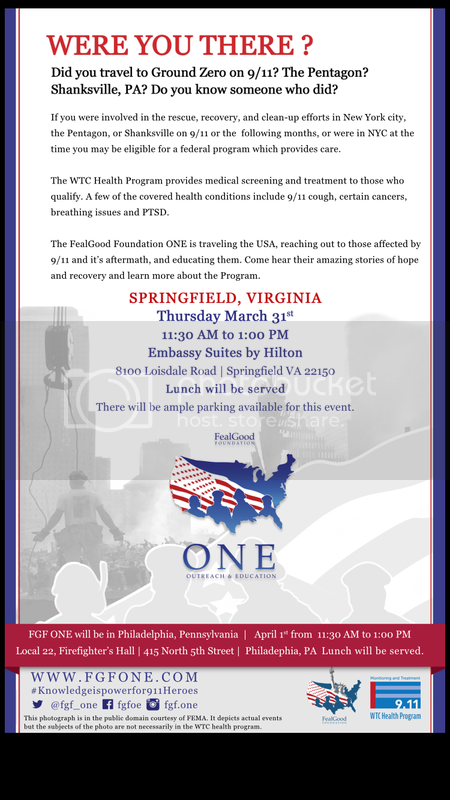 Please spread the word and if you are a 9/11 responder living in the region (WTC, Pentagon, Shanksville) please attend. These are your benefits fought so hard for by Brothers like Officer James Zadroga, Firefighter Ray Pfeifer, Jon Stewart, Steve Buscemi and a lot of other Brothers who are no longer with us. Don't lose out.